Employers have a duty to accommodate the needs of their employees to ensure they have equal opportunities for, access to, and benefits from employment. The need for accommodation in the workplace may arise for many reasons. An employee’s pregnancy, disability, health, caregiver responsibilities, or religious beliefs are all things that may require an employer to provide accommodations at one time or another. Accommodation may involve modifying your facilities (i.e. making them wheelchair accessible), policies and procedures, performance goals, or decision-making practices. Employers may also find it necessary to modify an employee’s job duties, training, or hours of work. The Ontario Human Rights Commission (OHRC) sets out three principles for proper and respectful employment accommodations. 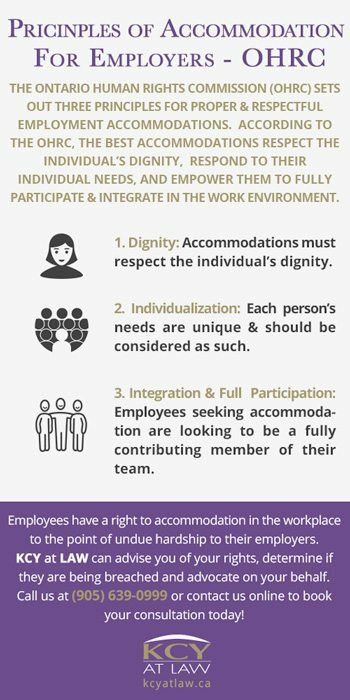 According to the OHRC, the best accommodations respect the individual’s dignity, respond to their individual needs, and empower them to fully participate and integrate in the work environment. Accommodations must respect the individual’s dignity. Consideration for an individual’s self-respect, self-worth, integrity and empowerment are essential to a dignified accommodation. This means that the accommodation an employer provides must not stigmatize or devalue the individual or their work. Accommodating an employee should not make the employee feel like they are a burden or of lesser value to their employer than any other employee. This also means that employers should respect the privacy and comfort of the employee seeking accommodation. Disabilities and mental and physical health are often deeply stigmatized and employees have a right to expect privacy in these regards. Except for the circumstances of the most extreme suspicion, employers should not ask an employee seeking an accommodation for documentation or any further ‘proof’ of their need for an accommodation. The employee’s word is, almost always, enough evidence for the need for accommodation. Each person’s needs are unique and should be considered as such. Accommodation is not a one-size-fits-all solution. What is helpful to one employee may not work for another. While it is important to have general policies and procedures for accommodations, employers need to have a degree of flexibility. Sometimes, providing an employee with an accommodation is straightforward: you facilitate a leave of absence or you allow an employee to start and end work half an hour early so they can pick up their child from daycare. However, finding the best accommodation is often a process. Employee’s accommodation needs are sometimes complex and inconsistent, especially when they relate to their physical and mental health. When this is the case, it may take some time, experimentation and flexibility in order to find the most dignified, individualized and empowering accommodation possible. Although it is not the job of the employee requesting accommodation to come up their own accommodation solution, they should be involved in the process. Since they know their needs better than anyone, their input is indispensable when coming up with an appropriate and practical accommodation. Employees seeking accommodation are not looking for their employer to ‘take it easy’ on them. Rather, they are looking to be a fully contributing member of their team. Therefore, accommodations should maximize individuals’ ability to fully engage in the workplace. As an employer, one of the best starting points in a conversation with an employee requesting an accommodation is asking how can I help you be successful at work? This question allows the employee to focus on their needs and decide how much they want to disclose about their situation. The success of your employees will be reflected in the success of your business. It is in your interest to accommodate employees’ needs to ensure they can fully participate in – and therefore contribute to – the workplace. Accommodations often benefit more than the intended party. Many workers will, at one time or another in their careers find themselves in need of an accommodation. Therefore, developing policies that are adaptive and inclusive will allow you to manage your staff in a way that is productive and enables them to be their best selves. Employees have a right to accommodation in the workplace to the point of undue hardship to their employers. 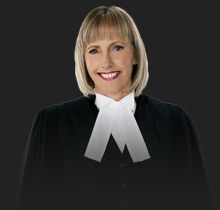 KCY at LAW can advise you of your rights, determine if they are being breached and advocate on your behalf. Call us at 905-639-0999 or contact us online to book your consultation today!